Your big day is fast approaching and you now have an opportunity to be in the limelight and make the world notice your brilliant aesthetic sense! Apart from those super-stylish outfits you plan to don for your wedding celebrations, the décor is the next best thing to showcase your fine tastes. We know you have an eye for beauty, but do allow us to give you some direction on how to make your wedding the talk of town – the best and also an easily accessible decoration idea would be to go high on ice! So do read the following decoration ideas with ice sculptures. Decorating the tables with an ice centerpiece is a classic idea. We suggest that you use a central theme to the wedding and get sculptures designed around the same. It could be traditional – dancing couple, swans and Cupid – or something contemporary like a modern art shape. If you find plain ice to be too bland for a centerpiece, remember that you have the support of flowers and translucent colors to add flair. Ice glasses decorated with details like color or dried flowers look stunning. We recommend you go for some of these for vodka shots. You can take it another step ahead by getting glasses made in whacky shapes to appeal to the groovy senses. Does an ice cube always have to be just that – a cube? No! We all have loved using fancy moulds as kids. So well, who says you can’t do the same at your wedding? 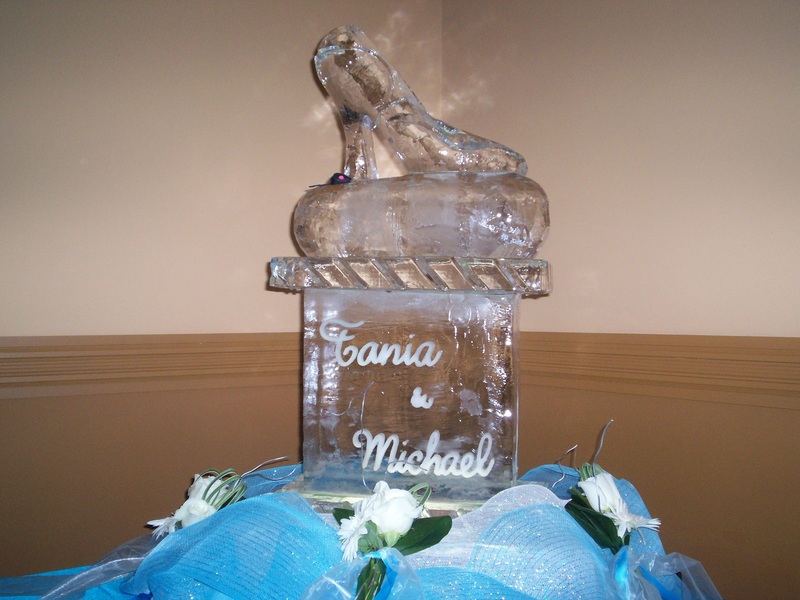 Ditch the cube and get some nicely designed ice shapes for your wedding reception. You could choose a single theme or go for an assortment of shapes. This new idea is sure to get attention and appreciation. Want to separate the eating area from the main reception area without getting your guests get cutoff from the activities going on in the banquet? Use an ice curtain. Get a nice design sculpted on it for combining aesthetics with function. A perfect combination of function and flamboyance, the ice luge is one of the best things you could keep in your reception hall. It not only looks very appealing to the eye but also serves to chill drinks down before they reach your guests. Ice is the perfect complement to floral decoration. If you are having a summer wedding, ice vases will ensure that the flowers stay fresher for longer. Just keep the temperature of the surroundings down. Buffet tables and ice sculptures go incredibly well together. A platter for salad or cold snacks, decorative pieces, cutlery holders – there is a lot you can do with ice on the food table. Also do put in some valuable elements of your own personality into these ice sculptures and you’ll have a wedding to remember!